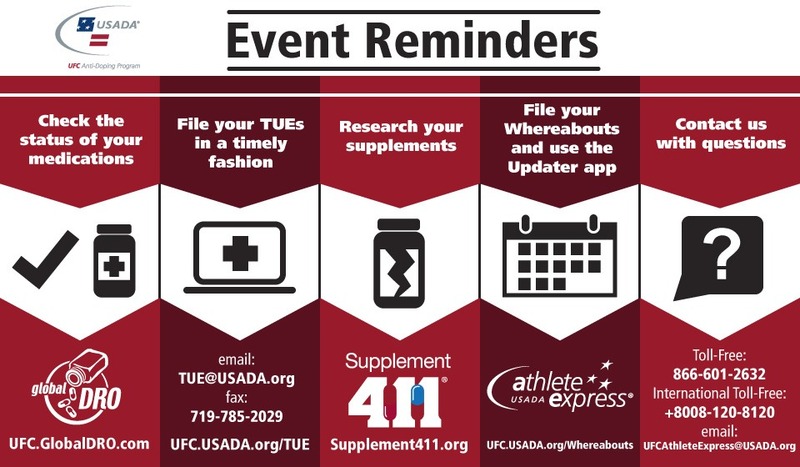 In advance of your upcoming event, here are a few friendly reminders from USADA. Good luck in your upcoming bout! Log in to http://www.ufc.usada.org or update your whereabouts on the USADA Updater App. Don’t have the USADA Updater App? No worries – search USADA in your application store. Don’t forget to include your travel days in your whereabouts submission. Double-check the status of your medications. Request a Therapeutic Use Exemption (TUE). Be aware that Athletic Commissions might also require you to submit a TUE application to them. Any substance or method prohibited by an Athletic Commission unless they are certain that an Athletic Commission TUE is in place.